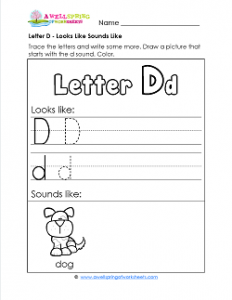 Thump, thump, thump goes the tail of the little doggie on this letter d looks like sounds like worksheet. He’s pretty doggone happy that you’re here thinkin’ of doing this page. So go ahead and print it out, pull out your pencil and crayons and get started! Trace each letter Dd and write a few more, neat as can be. Then draw a picture of another d word right next to this happy pup. Color your very best. Make the puppy proud!